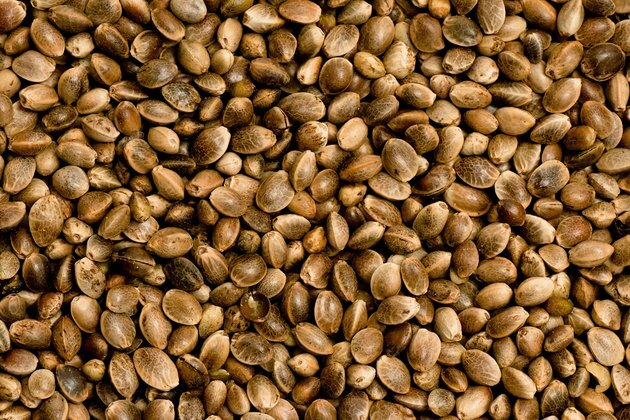 Hemp hearts are the edible insides of hemp seeds. Many health benefits accompany the consumption of hemp hearts because of their high and diverse nutritional content. For starters, they are a complete protein. Hemp hearts also contain the essential fatty acids omega 6 and omega 3. In addition, hemp hearts are a good source of both soluble and insoluble fiber. They are also packed with vitamins and minerals, including vitamins A, B1, B2, D and E, as well as the minerals calcium and iron. Hemp seeds contain 25 percent protein, 35 percent fatty acids and 27 percent carbohydrates (primarily fiber). High in fiber, hemp hearts have many health benefits related to the digestive system. Fiber consumption is essential for a healthy digestive system and keeps bowel movements regular. A digestive system with plenty of fiber is able to efficiently remove wastes from the intestines on a daily basis, which is a preventative measure for intestinal diseases. Soluble fiber works in the intestines to lower levels of LDL cholesterol, and insoluble fiber has been linked to lower risks of cardiovascular disease and diabetes. Also, hemp hearts are easily digestible by the human body. The balance of essential fatty acids paired with the complete protein found in hemp hearts promotes cellular recovery and development. Larken Bunce, an educator and clinical herbalist, states, “Hemp’s unique fatty acid composition and balance can have significant impact on inflammatory processes and cell membrane activities, which are the foundation of numerous chronic diseases, including cardiovascular diseases, cancers, neurodegenerative disorders, hypersensitivities and auto-immune conditions.” The high concentration of essential fatty acids found in hemp seeds also supports the transportation of oxygen to cells throughout the body. The presence of oxygen in cell membranes helps to block viruses, fungi and bacteria.